Where do we even begin?! The rugged beauty, the friendly and eclectic locals, the vibrant history, the cozy inns… Taos, New Mexico stole our hearts. Walking through the downtown, exploring the Pueblo, watching the snowfall… it all felt like a movie. A movie we didn’t want to end! If you’ve ever been, you’ll know what we’re talking about. And if you haven’t yet made it to Taos, please add it to your list. Right now. Have you ever stayed somewhere where you instantly felt at home? That’s Casa Gallina. Innkeeper Richard has done a phenomenal job with his rustic property - it’s that perfect mix of quaint and eclectic, and just about everywhere you turn is a photo opportunity. Spanish for “Hen House”, every morning we were greeted with fresh eggs (from the 40+ chickens they have on-site - hence the name), fresh coffee, baked goods, and even a frozen chicken treat for Sally! We’d sip on our coffee, whip up some eggs, and snuggle up by our fire. Our two-story casita (we stayed in the Bantam Roost) was so perfectly cozy we were tempted to never even leave the property! It’s THAT magical. Stay at Casa Gallina. Please. And bring us with you! Don’t get us wrong - we’re anxious to experience Taos in another season, but the holiday season here is something special. Thanksgiving through December is “Yuletide in Taos” - a plethora of festive and unique New Mexican traditions and events. From yuletide caroling and tree lighting ceremonies to holiday fiestas and bonfires, it truly is the most wonderful time of the year in Taos! We had a blast at the “Lighting of Ledoux”, where the historic street of Ledoux glows with the light of farolitos, luminarias, and bonfires. Local shops and galleries are open late, and locals and travelers alike are roasting marshmallows and swapping stories. It was beautiful. Famous for being one of the oldest continuously inhabited communities in the country, the Taos Pueblo was built roughly 1,000 years ago. This historic (and tiny) village brings in tens of thousands of visitors each year, and it’s easy to see why. You feel as though you’re stepping back in time! Built entirely out of adobe, over 100 Taos Indians still call the Pueblo home. $10 gives you access to the Pueblo, an informational walking tour (that we highly recommend), and the freedom to walk around and explore on your own. It’s incredible! Orlando’s: New Mexican cuisine with a twist. This is what we consider to be the best place to try red and green chile. Our favorite was red!. Lambert’s of Taos: Head straight up the stairs to their “Treehouse Bar”, where you can grab a seat with the locals and order off their bar menu (Which we prefer!). Nothing tastes better than their Flat Iron Steak and Mediterranean Plate after a long day of sightseeing! Taos Cow: Located in Arroyo Seco, this ice cream shop has been named one of the best in the nation - and we have to agree. Try the Mexican Chocolate! Parcht Bottleshop + Bites: We loved this little wine shop. The people are friendly and very knowledgeable when it comes to wine, and their cheese boards are top notch. The Love Apple: This is the perfect date night spot. They serve local and organic food in a quaint and romantic setting. We’d go back to Taos just for this spot! Make a reservation in advance - and it’s cash only, so plan accordingly! Manzanita Market: Cute, fresh and healthy - we stopped in this cafe numerous times for a snack or a breakfast sandwich. Chokola Bean To Bar: Small batch, organic chocolates that are not only high in quality, but they’re also absolutely delicious. (And they’re happy to have you sample it.) If it’s cold outside, try their drinking chocolate! If you’ve been following us for a while, you know we love good coffee. We’re happy to report that Taos’ coffee scene is strong. Literally and figuratively. Two of our favorite spots were Coffee Apothecary (the new hip spot in town) and World Cup Cafe (where the locals hang). Try them both and let us know what you think! There’s SO much to see in this neck of the woods. Taos is filled with galleries, museums, shops, hiking trails, etc. Some of our favorite spots were places we randomly stumbled upon when we were exploring - so we encourage you to do the same! Earthship Biotecture (solar houses that you have to see to believe), The Rio Grande Gorge Bridge (the second-highest bridge on the US Highway), Taos Mesa Brewing for a beer (the “Mothership” location is on the way to the gorge), and the Millicent Rogers Museum (filled with fascinating exhibits on the American Southwest) are just a few spots that shouldn’t be missed. We also loved walking around the neighboring town of Arroyo Seco, sprinkled with eclectic shops and cafes! 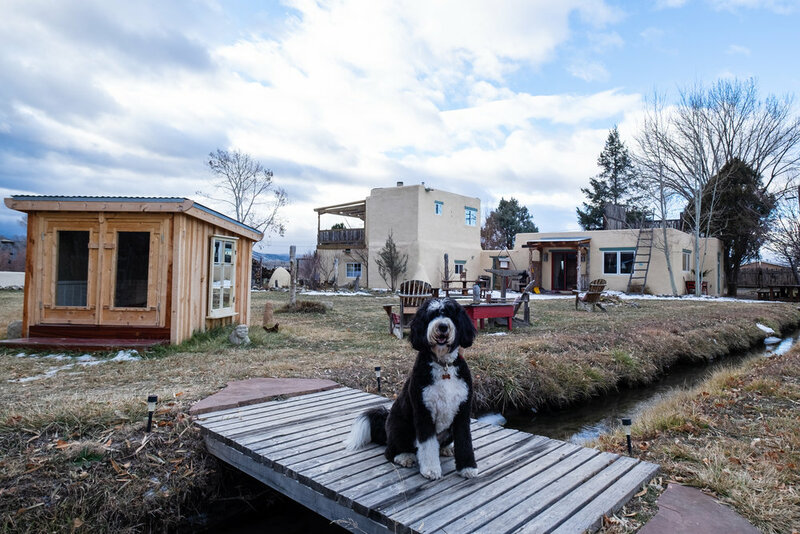 Life moves at a slower pace in Taos… and we love it for that. Pack a good book, take a midday nap, practice yoga, and watch the sun set over the mountains. We’re typically “on the go” people when we travel, but that wasn’t the case here. We rested. We ate. We saw a lot - but we also relaxed. We found balance in doing both. If you’re looking for a peaceful retreat, this is your spot. We have a feeling it just might be our new yearly tradition. Since our big “Month Long Roadtripping Extravaganza”, we’ve been itching for an excuse to get back on the open road. After stumbling upon some photos and doing some research, we decided to do a last-minute trip to Page, Arizona and Zion National Park. The amount of natural beauty and grand landscapes that we saw in four days still has us shaking our heads in awe… this trip was life-giving to us in so many ways, and it’s SO DOABLE. Here’s what we did! Let’s start with Page, Arizona. You’ve probably never heard of this little town before, but bear with us. It’s located next to Horseshoe Bend and Antelope Canyon, and countless hikes and areas to explore. It’s an affordable town to stay in, and it’s incredibly close to all of the action. We stayed at the Hyatt Place Page/Lake Powell, and it was great. Big, clean rooms, hearty breakfasts, stunning views, and a helpful staff. We highly recommend it! Words don’t do this place justice - so we’ll let the photos do the talking. We happened to be there during some pretty intense rainstorms… We did see some sun break through for an hour (WOO! ), but we definitely were soaking wet by the end! Now because of the rainy weather, we weren’t able to explore Antelope Canyon on this trip, which we were definitely bummed about. (Keep that in mind when planning your trip: rain = mud and/or flash floods, and if it’s muddy they close the canyons!) But we made the best of it and explored other spots - including the Glen Canyon Dam and lookout points. All incredibly breathtaking - especially if you’re scared of heights like we are!! TIP: We think two nights in Page is perfect. That gives you ample time to see the sights, hike around, and explore. Beyond that there isn’t a whole lot to do there, and dining options are pretty limited. Pack snacks! Just two hours northwest of Page, Arizona is Zion National Park - and it just might be our favorite national park yet. We spent the last two nights of our trip at the Cliffrose Lodge, located just steps from the entrance to the park. Not only was the location phenomenal, but the newly remodeled rooms were gorgeous, and the mountain views from our balcony left us in awe. We couldn’t have picked a better place to stay! There are several stunning hikes in and around Zion National Park, but the big “bucketlist” one for us was “The Narrows”. It’s anything but a typical hike - as you squeeze through slot canyons and wade through a river… and it was absolutely the highlight of our trip! Rent equipment. We went when the water (and air!) was cold, so we rented waterproof pants along with boots and a walking stick. In the summertime, all you need are good water shoes and a walking stick. You might even find yourself jumping all the way in! Go early. We left on the first shuttle bus at 7am (it’s only accessible by shuttle), and it was perfect. We almost always had the hike to ourselves!! But on our way back it quickly became a zoo, as it’s one of the most popular hikes in Zion. The earlier you go, the better chance you have at avoiding crowds. Pack water & snacks. No matter how you do it, it’s a long hike. Plan on being gone at least five or six hours, so plan accordingly. We brought a big canteen of water and some Clif Bars to hold us over, and that was perfect. Our time in Zion was limited. Unlike Page, two nights definitely wasn’t enough for all that we wanted to see and do! We recommend going for at least three nights, so you have enough time to hike, drive, and explore. Oh, and the dining options are great. Some of our favorites were Zion Pizza and Noodle Co, Thai Sapa, and Oscars Cafe! This road trip was quick, and had a fair share of “bumps” in the road - but it’s one of our favorite ones we’ve done yet. We can’t wait to get back to Page and explore Antelope Canyon, and adventure through Zion National Park again… and maybe even bring our pup next time! Planning a road trip of your own? One way to cut hotel costs (and add to the adventure!) is by renting an RV with RVshare. They're the largest, safest and most trusted RV rental marketplace with wide ranging inventory from affordable pop-ups to luxury motorcoaches. Whether it's just you and your significant other out on the open road, or you're planning a trip with your family - they have something for everyone! They even have pet friendly RV rentals too! RVshare also has 24/7 emergency roadside assistance on every booking, making it a very safe and trustworthy travel option. Head to RVshare.com to learn more! Over 5,000 miles of driving. One whole month on the road. Just the two of us. Oh, and our 60 pound dog. Are we crazy? Probably… but these past four weeks have been some of the craziest/best/most rewarding times of our lives. When we started planning our journey, we knew we needed to do this whole thing right. After all, that’s a lot of time just the two (err.. three!) of us, and that’s a heck of a lot of time in a car. We both have smaller, older cars that are great for getting from A to Z, but when it comes to driving cross country, we weren’t sure they would make it. 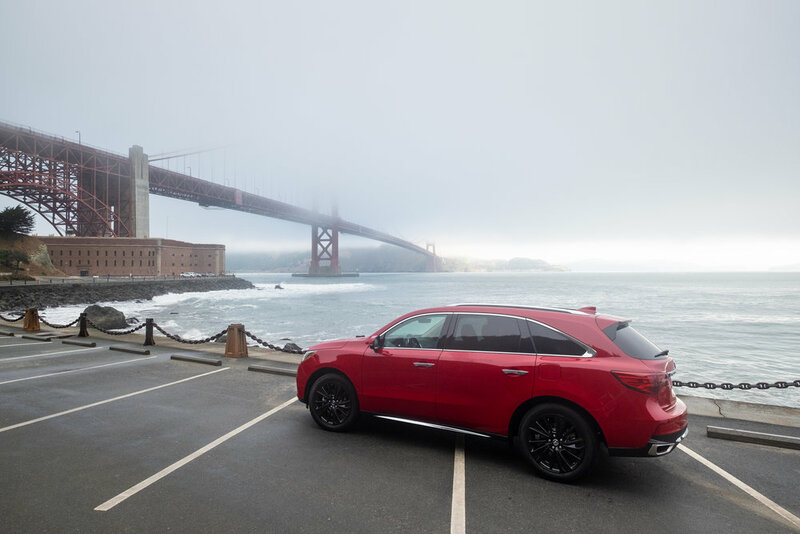 Thankfully, our friends at Acura let us try out a brand new, bright red, 2018 Acura MDX… what we affectionately titled “Red Rover”. With Red Rover, it was love at first sight. From the shiny, sleek exterior to the spacious, luxe interior, the Acura MDX is the perfect mix of sporty yet efficient. When you’re driving the MDX you feel more like you’re gliding, and every feature (and there are so many features!) is perfectly placed on the dashboard. The seats - oh, the seats. They’re like butter. Not like sticky and gooey butter, but like soft, comfy, airy butter. Too much? Regardless, we were instantly obsessed - suddenly somehow the idea of driving 5,000 miles cross country didn’t sound too bad! It didn’t take us long to realize that once you have an MDX, you’re a part of the “club”. We’d pass other Acura MDX’s on our journey, and they’d all smile and wave at us - like we were already friends! One campground we went to, the cabin next to us had an MDX as well. We spent a solid thirty minutes talking to them about road tripping through the US, and how they wouldn’t do it in anything but their MDX. We whole-heartedly agreed! We found ourselves driving through all sorts of terrain with Red Rover - through windy, cliff-lined roads along the California Coast, to chasing waterfalls along bumpy dirt roads in Alberta, Canada, she handled it like a CHAMP. We felt safe in our Acura MDX, it’s sturdy, reliable, and even though it’s big, it’s incredibly easy to maneuver. In the entire month we were gone, we never had a single problem (except Bobby might have gotten pulled over once)! Looking back, we remarked how amazing it was that we never once got homesick. Not once! We 100% attribute that to the fact that Red Rover really became our home! Even though we stopped at over twenty cities along the way, we always had a “home base” in our Acura MDX. We’d have our little “things” placed right where we’d need them - both pairs of sunglasses had their home, our mints were in a hidden compartment in between the seats, the XM radio was programmed to our favorite stations, and our seat heaters (and coolers!) were set to just the right temperature. It may sound silly, but these little routines gave us a sense of normalcy throughout our trip that really made a big difference. Not to mention our luggage fit perfectly in the back - and we had a LOT of luggage! If this sounds like too much driving for your liking, maybe we can propose a helpful alternative? One way to cut hotel costs (and add to the adventure!) is by renting an RV with RVshare. They're the largest, safest and most trusted RV rental marketplace with wide ranging inventory from affordable pop-ups to luxury motorcoaches. Whether it's just you and your significant other out on the open road, or you're planning a trip with your family - they have something for everyone! They even have pet friendly RV rentals too! RVshare also has 24/7 emergency roadside assistance on every booking, making it a very safe and trustworthy travel option. Head to RVshare.com to learn more! Life is a Highway - And Highway One is Open!! 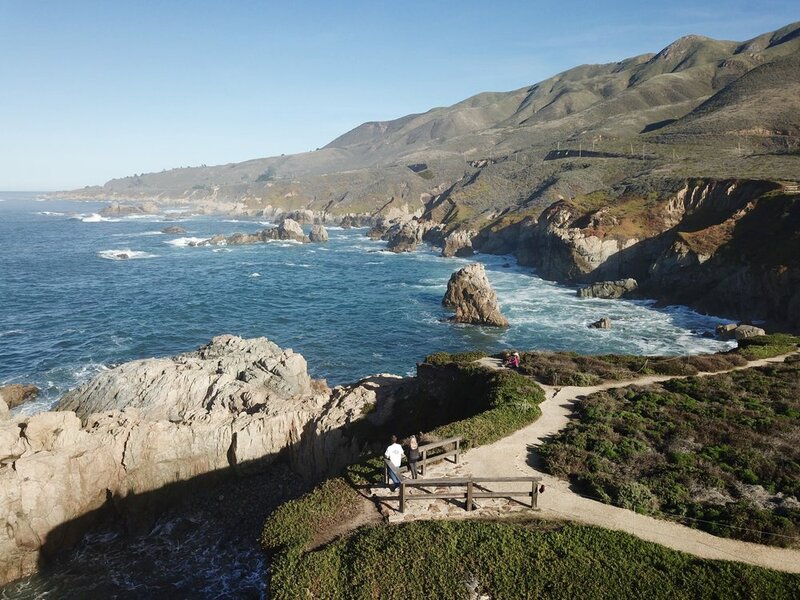 One of our favorite drives in the world is the coastal-hugging California Highway 1. (So much so, that we drove it on our honeymoon!) The scenery never ceases to amaze us - no matter the weather or the time of year. 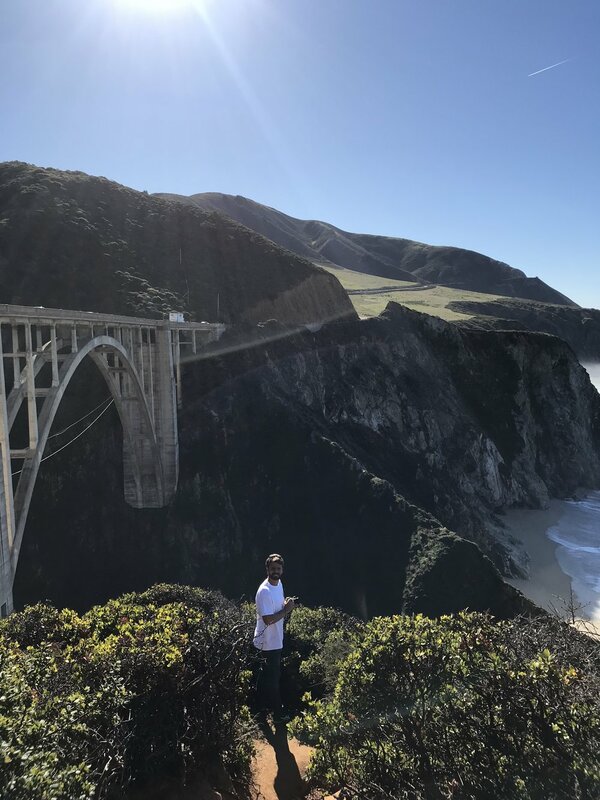 From the surf swells in Santa Barbara, to the cliffside hikes in Big Sur, to the majestic bridges entering Monterey County… it’s natural beauty at its finest. Due to some massive landslides, Highway 1 was forced to close. For over a year and a half crews have been working day in and day out to get this scenic drive back to what it once was, and FINALLY the day is here! Highway 1 is open, and it’s better than ever!!! We jumped at the opportunity to explore our favorite highway once again, at the start of our road trip nearly three weeks ago - and Alli nearly cried with joy. 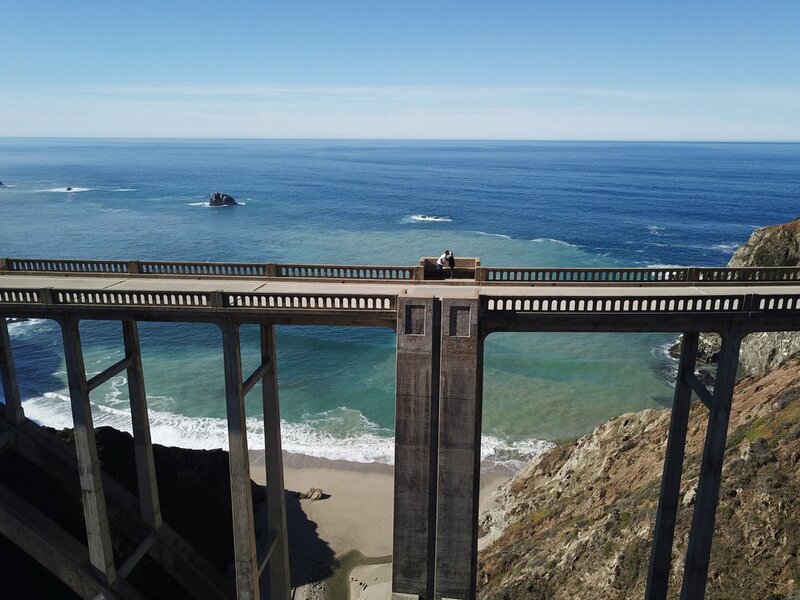 Highway 1 in the summertime is postcard-worthy, and you better believe we stopped wherever we could to take it all in! This trip up the highway was especially significant for us, as it’s the first time we’ve brought our fur-baby Sally along! (Dog lovers out there, you get it.) We had SO much fun taking her around our favorite stops on the drive, one highlight being the elephant seals. We’ve never seen our little bernedoodle so wide-eyed! We’ve met people from all over the world that hear we’re from California, and immediately tell us that they’ve driven Highway 1 - most of them numerous times! It’s captivating and addictive, no matter what kind of traveler you are. You could pack a tent and camp at every stop, or stay in world-famous five star hotels, there’s literally something for everyone. And there’s never a bad time to do it either, the change in weather only adds to the dramatic coastline. 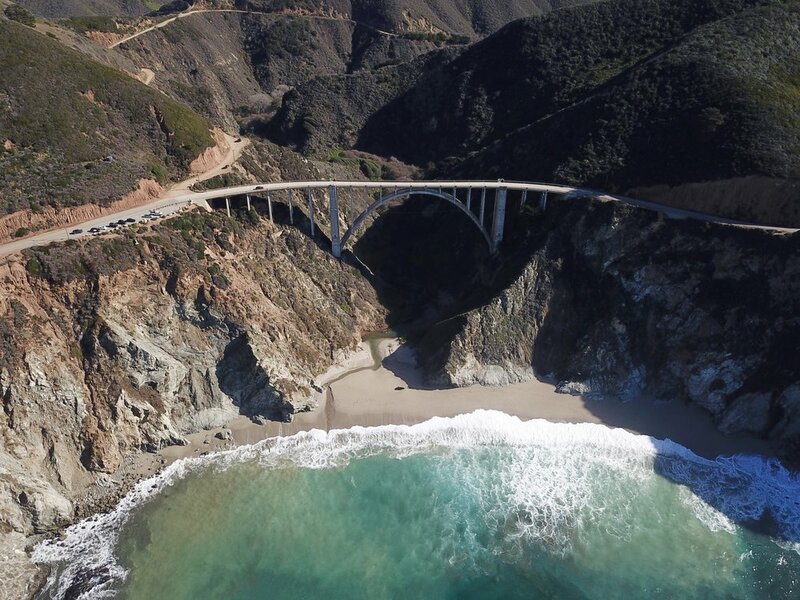 If the Rascal Flats song is true, and “Life is a Highway”, we’d like to think of it as Highway 1. Beauty everywhere we turn, pure joy, and endless discoveries… Sounds like an epic life to us! 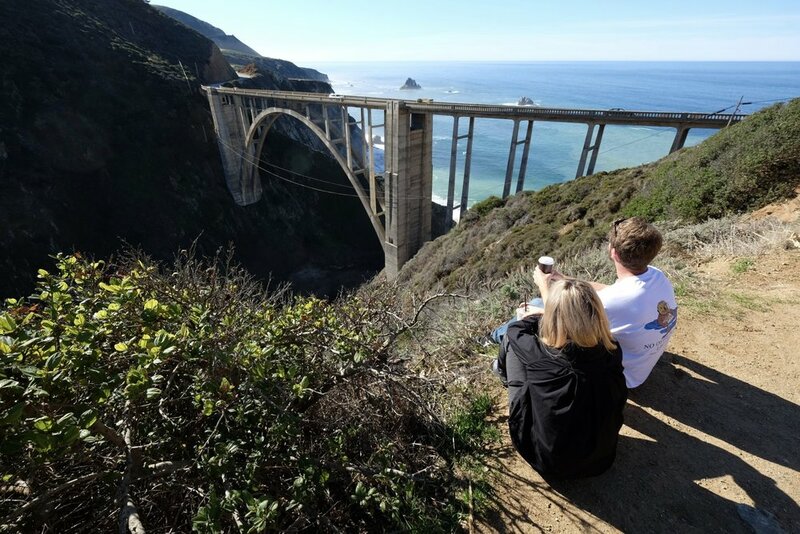 Below is a throwback to our first days of marriage... on Highway 1 on our honeymoon!